I love being creative with food and trying new things. Before early last year, I had never tried (or even heard of) farro. Well, more than likely, I had heard of it but just ignored it because I had no idea what is was… a grain. 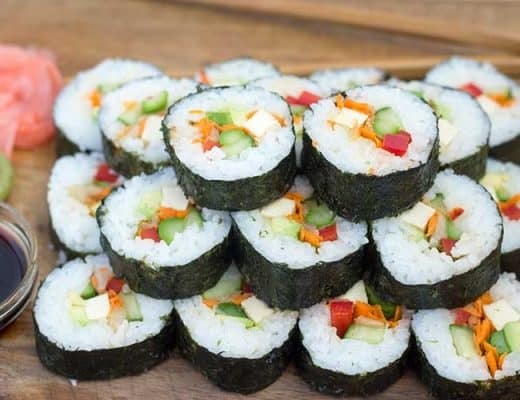 It’s similar to rice is size, but with a much heartier texture. So, since it was like rice, the idea was to try it in risotto! This Instant Pot farro risotto is the result. 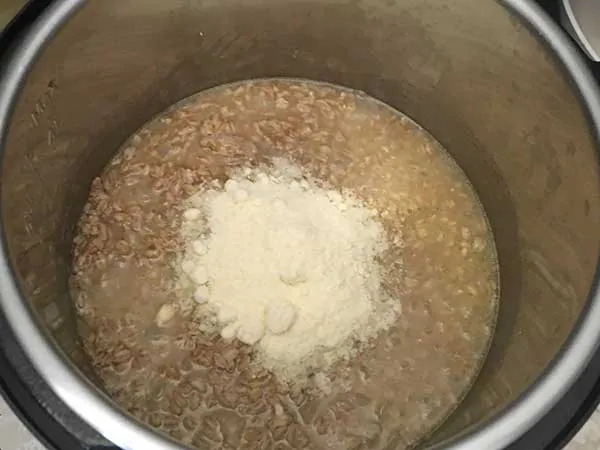 While this recipe is called risotto, the final product will be significantly different than traditional risotto. 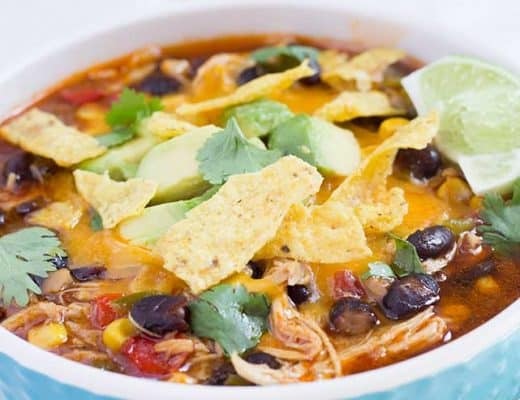 Both the cooking style and flavors are the same, but using a totally different grain which will create a completely different texture and broth. 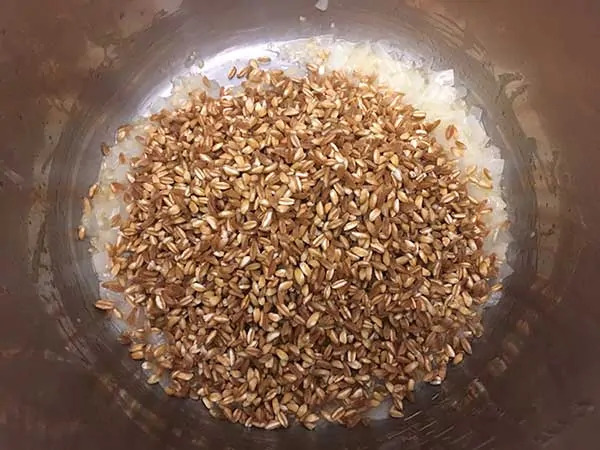 Rice causes a much more starchy/creamy consistency, while farro “risotto” will be more on the brothy side. Using sauté setting… melt butter. 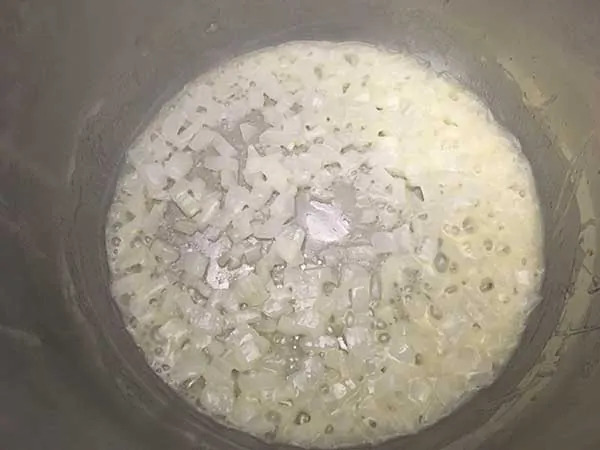 Add onions and cook until soft and translucent (about 3 minutes), stirring frequently. Next, add garlic and cook for another 30 seconds. …and stir well, making sure to coat each grain with the butter. Cook for about one minute to toast, stirring frequently. Add wine and give a good mix. Cook until nearly all the wine has been absorbed into farro (about 4 minutes), stirring almost constantly. Finally, add chicken broth and salt and mix well. Lock lid and cook for 10 minutes at high pressure. Once cook time is complete, allow pressure to release naturally for at least 10 minutes. Then quick-release remaining pressure. Add lemon juice and parmesan cheese to pot, give a good mix, and allow to sit for another few minutes before serving. 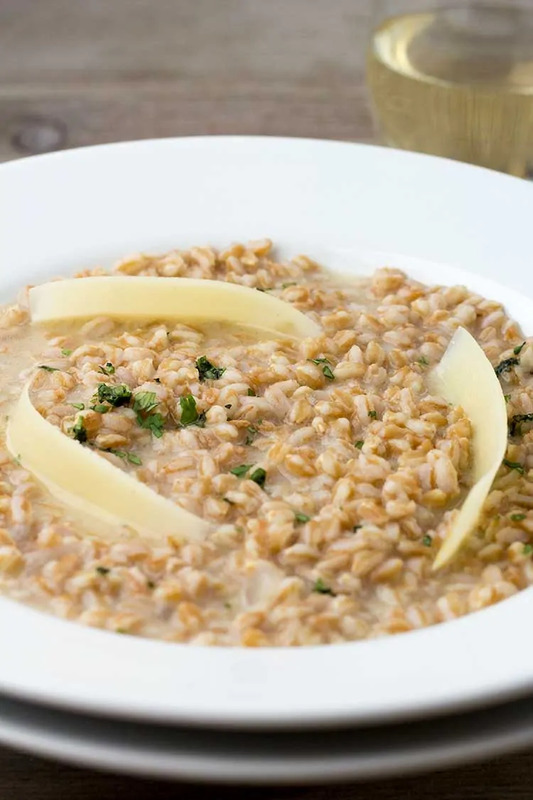 ★ Did you make this Instant Pot Farro Risotto? 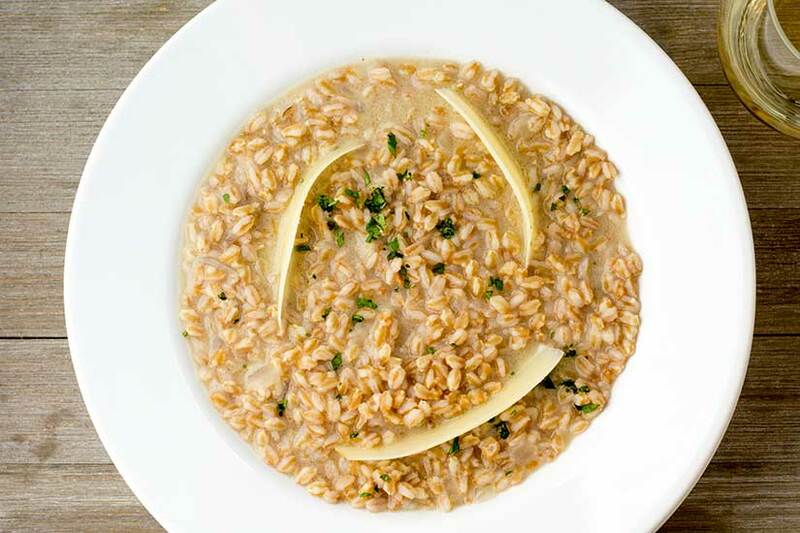 While this is called risotto, the final product is different than traditional risotto. It is more brothy and less creamy. Still delicious! 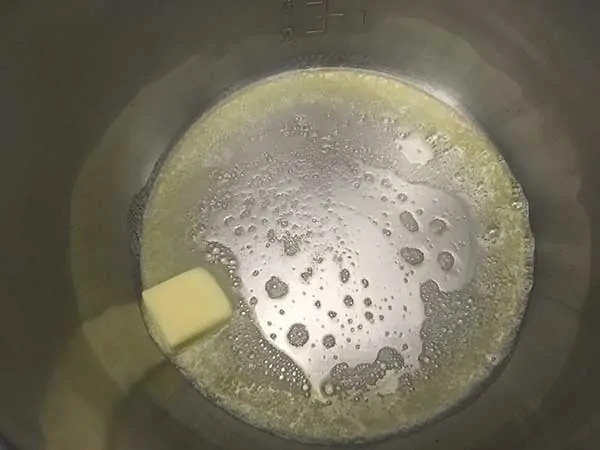 Using sauté setting… melt butter. Add onions and cook until soft and translucent (about 3 minutes), stirring frequently. Next, add garlic and cook for another 30 seconds. 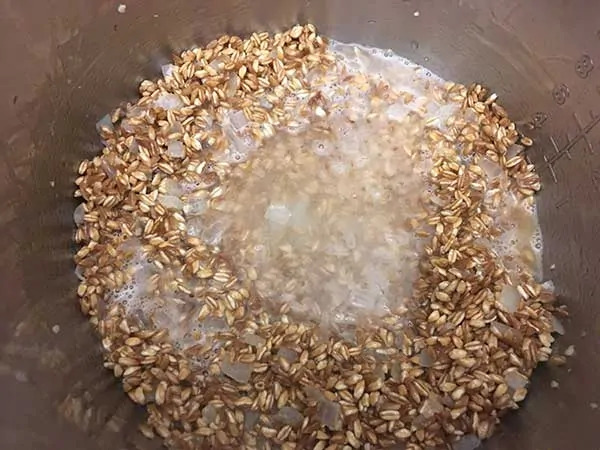 Then add farro to pot and stir well, making sure to coat each grain with the butter. Cook for about one minute to toast, stirring frequently. Add wine and give a good mix. Cook until nearly all the wine has been absorbed into farro (about 4 minutes), stirring almost constantly. Now, add chicken broth and salt and mix well. Lock lid and cook for 10 minutes at high pressure. 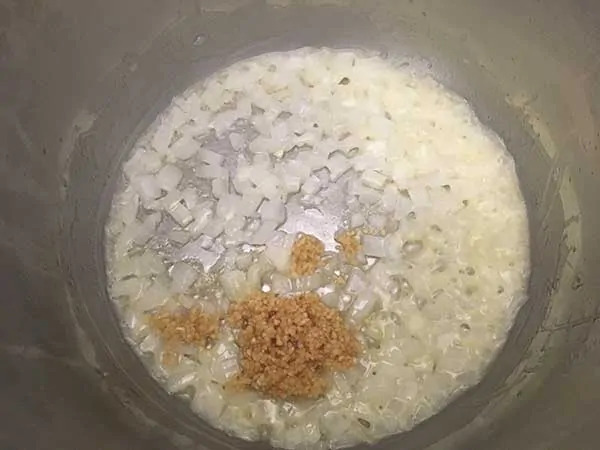 Finally, add lemon juice and parmesan cheese to pot, give a good mix, and allow to sit for another few minutes before serving. Top with shaved parmesan. 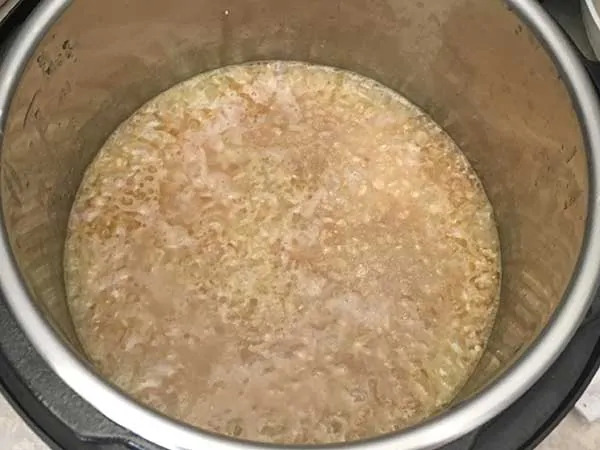 While this recipe is called risotto, the final product will be significantly different than traditional risotto. 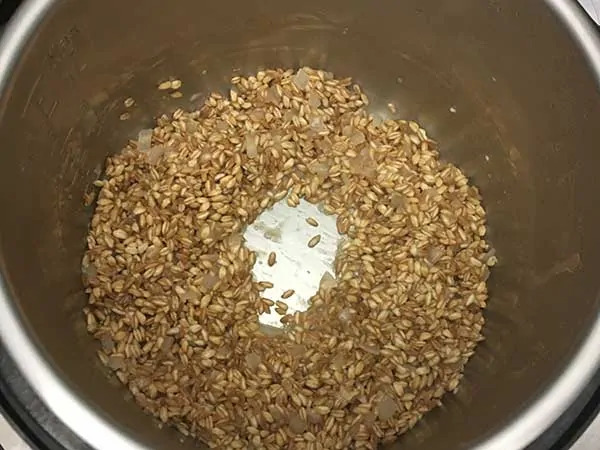 Both the cooking style and flavors are the same, but we're using a totally different grain which will create a completely different texture and broth. 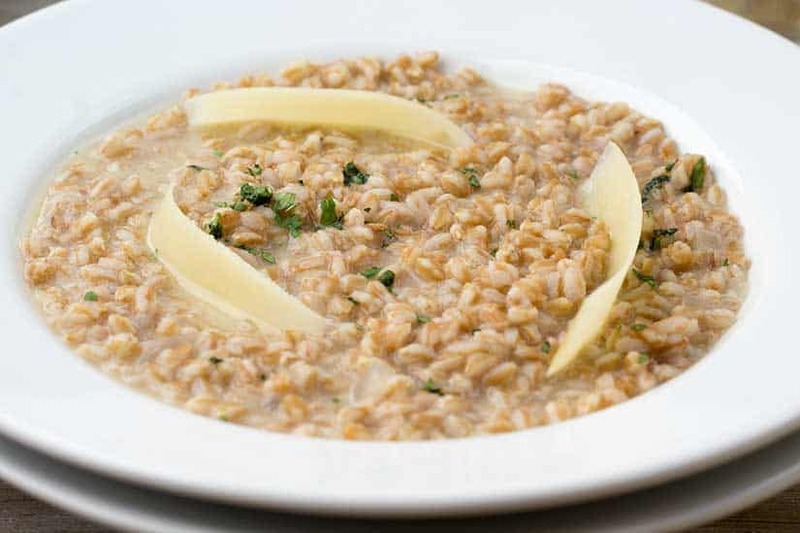 Rice causes a much more starchy/creamy consistency, while farro "risotto" will more on the brothy side. I’m sorry–this was way too salty. Had to toss it. Hmmm… Interesting, it’s only 1 teaspoon of salt. Is it at all possible you accidentally used a tablespoon? Either way, sorry it wasn’t to your taste. Adding additional salt to 3.5 cups of regular, salted chicken broth does make it a bit too salty. 1 tsp of salt should be good with unsalted chicken broth. Delicious! I didn’t read carefully and only saw after it was done that it was a more brothy consistency, but it’s so delicious it’ll get eaten. 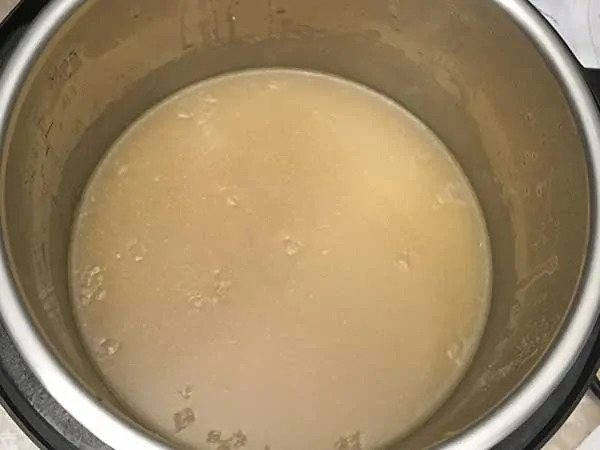 I used unsalted broth (homemade) and 1 tsp of salt and didn’t find it too salty. 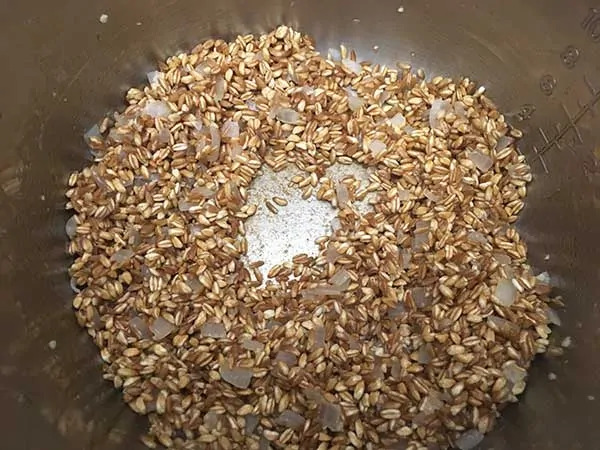 FIrst time making farro, it was amazing! A health coach recommended it for plant base during protein. Came back for the recipe to make it a second time. 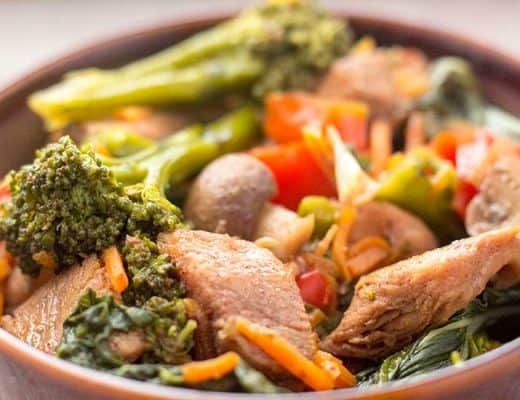 I used mushroom broth since that’s what I had on hand & was a winner!